“pathos”, the ability to fire emotions and generate feelings. What does this all mean? It means that we have to learn the Power of Communication, the ability to motivate, to inspire, to share deep meanings, instead of swimming in a pool of banality and empty gossip. Many phrases from the ancient world shade light, and we have to look for them where the Greco-Latin Culture left its seeds. But also in several modern thoughts found in the Anglo culture, at least on its best humanistic side, and for sure not in its materialistic side. The power of some words and mottos is so great that they are still used today after 2000 and more years. But there is more. 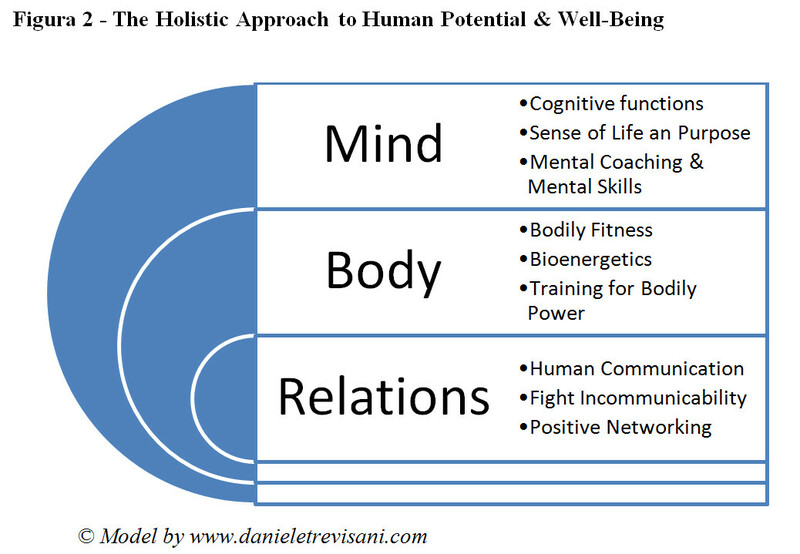 Human Potential expression requires not only a good and healthy communication environment (ecology of communication), but a healthy mindset that keeps a positive psychology inside our soul, and a strong attention to our bodily machine, its nurture, its well-being, obtained via physical exercise, good nutrition, and a clear mind. All the three aspects are intrinsically correlated. In this Holistic view, wellness and performance depend on the degree to which we are able to set these conditions, despite what the environment presents us as “given state”. To go beyond the “given state” and look for our Full Potential enables the expression of incredible performances and contributions to mankind, and this is our sacred mission. A healthy mind in a healthy body is not only an ancient motto. It is a way of life that is ordinarily unpracticed from ordinary people, and managers in the companies, where the number of hours spent in the office becomes the benchmark, rather than the real intellectual contribution, the quality of your ideas and energies you generate in your working environment. Your real energetic contribution to your company is completely lost, confused with “hours spent inside”. You even lose the ability to distinguish the people that are around you (coworkers, consultants, trainers, friends) in terms of the real energies the can provide and bring and you start measuring sick parameters, things as age or career level or the car they have or where they live. Well, let me tell, you, Albert Einstein – in this evaluation system – would have never come out of his desk as clerk, since he was not in the academia and was not a well-paid, well dressed manager with a fancy car. But his ideas changed the world. So, where do you want to be? On the side of the material or on the side of the immaterial world? Or in a good balance between them, and if so, where? Are you able to spot people with great ideas? How do you measure them? Latins believed that since we are born we are fully involved in a journey. We run, whether we like it or not. We stop, whether we like or not the stopping areas and landscapes we encounter. And in this world we need to feed our soul and our body with positive energies. Spa as modern structures where originated by the Romans and made free for all the “citizens” in Rome. A Spa is a location where mineral-rich spring water is used to give medicinal baths. Spa towns or spa resorts (including hot springs resorts) typically offer various health treatments. The belief in the curative powers of mineral waters goes back to prehistoric times. Such practices have been popular worldwide, but our culture is so spiritually poor that – despite the Roman habit of having them free and used for meeting, socialization and conversation places – now it has become an elite costly service and not a public service. This is just one of the thousands of “ways of living” that we can and must recuperate. Pilar Ferré, David Ventura, Montserrat Comesañ, and Isabel Fraga (2015), The role of emotionality in the acquisition of new concrete and abstract words. Frontiers in Psychology, 2015 Jul 2;10(7). The phrase was a favorite of American President Harry S. Truman. Riverside Military Academy in Gainesville, Georgia uses the phrase as its motto. Hargrave Military Academy in Chatham, Virginia uses the phrase as its motto. S.C. Anderlecht uses the phrase as its motto. Teacher’s College of Columbia University has this phrase engraved on its Horace Mann hall, on 120th street in New York City. ASICS, company name derived from the phrase. Carlton Football Club uses the phrase as its motto. Army Physical Training Corps (APTC) uses the phrase as its motto. Asociacion Atletica Argentinos Juniors, uses the phrase as its motto. The Israeli Institute of Technology athletics teams use the phrase as their motto. Widener University and the State University at of New York at Buffalo use the phrase as their motto. The phrase appears in stone on the western facade of the HPER (School of Health, Physical Education and Recreation) at Indiana University in Bloomington, Indiana. It is the motto of Dhaka Physical Education College in Dhaka, Bangladesh. It is the motto of Sparta High School in Sparta, New Jersey. John Locke (1632-1704) uses the phrase in his book ‘Some thoughts concerning education’. Is the motto for Bjelke-Petersen School of Physical Culture, Australia. Mens Sana Basket, a prominent Italian basketball club. Motto of Beale Gaelic Football Club from County Kerry. Used in the film Agantuk by Satyajit Ray. Is the motto of Bridgewater Junior Senior High School in Bridgewater, Nova Scotia.